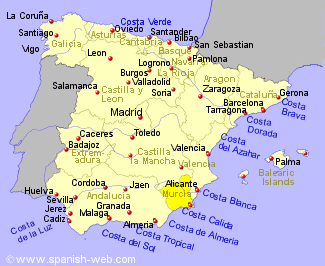 Murcia has a strong Arabic tradition in cooking and a wealth of produce from fertile fields. Salads are a speciality here which includes Ensalada Murciana, escarole, tomatoes and watercress, also a dish combining sweet green and red peppers, Mojete Murciano. These are eaten with chunks of bread. You will also find snails cooked with thyme, rosemary and fennel with a spicy tomato sauce, and Tortilla Murciana, an omelette with tomatoes, peppers courgette aubeergine and ham. Menestra, like a vegetable garden, is a stew made up with most of the land's produce in one pot. Dorada a la Sal is a popular fish dish covered with coarse salt baked and served with a garlic sauce, parsley and oil or a, garlic mayonnaise. Fruit is plentiful in this area offering oranges, figs, grapes and many more.